The Deadpool movie was a real dark horse in 2016, nobody expected it to be as popular as it was, it broke the current mold of comic book movies with it’s adult humour and funny take on violence. A year later the world is eagerly awaiting news on the sequel and the big question has been who will play Cable who was confirmed to be a big part of the sequel in the post credits scene. Cable comes from the future and is the son of Cyclops (Scott Summers) and Madelyne Pryor (Jean Grey’s clone), it’s going to be real upgrade on the first movie as we’re going to have more well known mutants, Cable is one fans have wanted to see in the X-men movies for years. 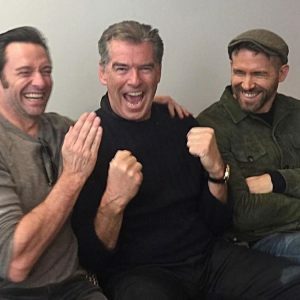 There have also been a lot of comments from both Ryan Reynolds and Hugh Jackman regarding Wolverine turning up in the sequel, Jackman has said his next Wolverine movie will be his last but he’s also said that a few times which has lead to some strong rumours he will be in Deadpool. In these pictures released from Ryan Reynolds on social media it looks like he’s getting together with Pierce Brosnan and Hugh Jackman to talk business, usually on movies like this they will get the main stars together to sign contracts, this way it makes it easier to guarantee everyone signs up to the same deal and they can start production. 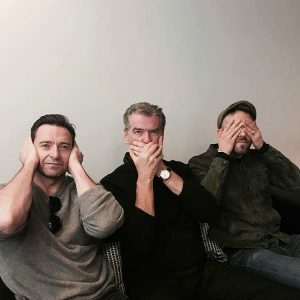 If that’s what this is it looks like Brosnan may be playing the infamous Cable. So far it looks like fans have reacted well to the idea of this so far as it looks like it could be a really good casting choice, Wolverine has one more movie left and production on Deadpool 2 can finally start.